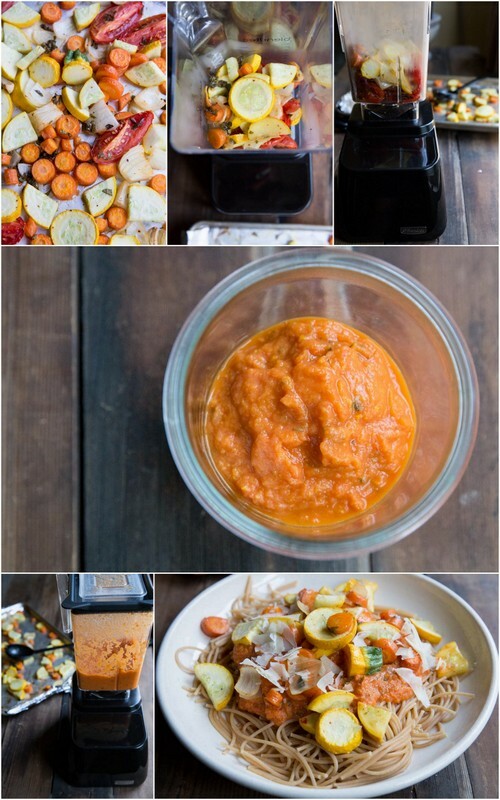 This Roasted Vegetable Pasta Sauce is so key for fall meals! The mixture of roasted tomatoes and vegetables in pasta sauce makes for a perfectly hearty and healthy vegan meal. I know it’s a ‘thing’ to sneak in vegetables to your family meals but why can’t we just feed our family vegetables. Maybe I’m naive in this (my kiddo was only 1 and a half when I first posted this recipe) but veggies are delicious and sometimes they make ordinary meals like spaghetti even more flavorful. 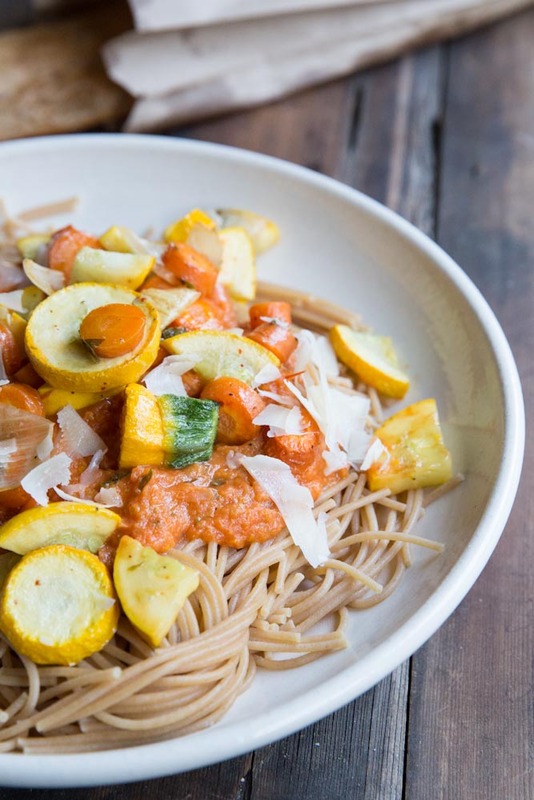 This roasted veggie vegan pasta sauce is straight up roasted tomatoes and veggies in all their glory, roasted in the oven until they are slightly brown and caramelized, then blended into thick and almost creamy sauce. 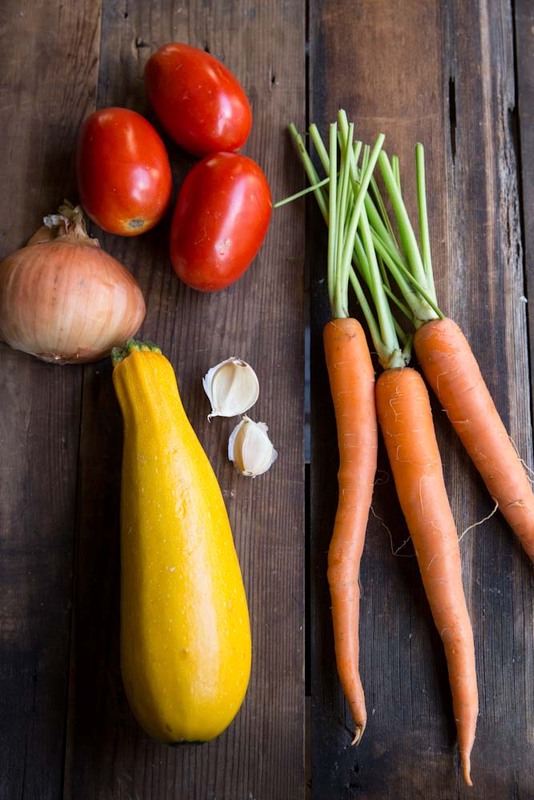 All you need is a blender and an assortment of veggies! 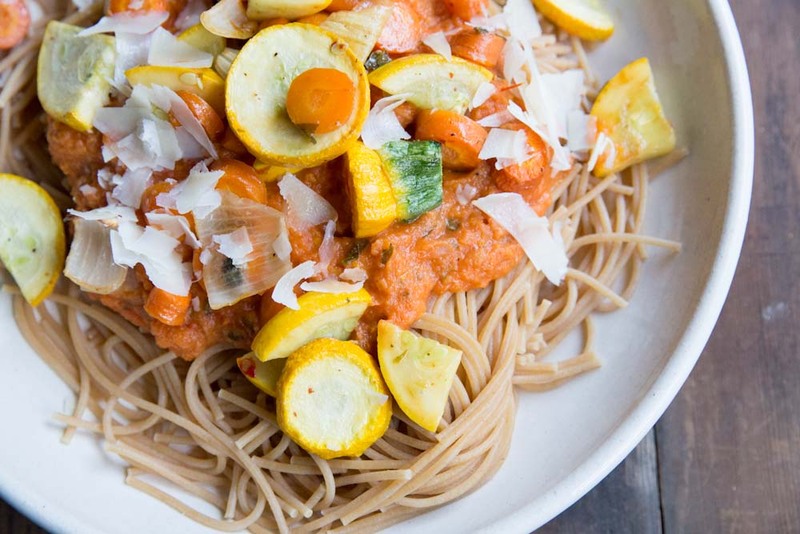 For this vegan roasted veggie sauce I like to use tomatoes, carrots and squash. You could sub out the Summer squash for a more fall flavor like butternut or acorn squash if you’d like. No special equipment is needed but a good blender does make the sauce extra creamy and smooth! A good blender makes this creamy vegan sauce pure bliss! A few other things I really enjoy about the Blentec blender is that is that you can quickly make salad dressings and smaller portions of things like pureed veggies or baby food. So far, we’ve used it for soups, of course, smoothies, baby foods, nut milks and homemade flours (like oat flour or almond flour). I’m looking forward to making nut butters, soft serve ice cream and maybe even a few icy cocktails! Roma tomatoes are most common but you can use any tomato of similar size. My favorite to use for this recipe is San Marzano if you can find them (they make excellent tomato sauce as they have little water content and not too many seeds). 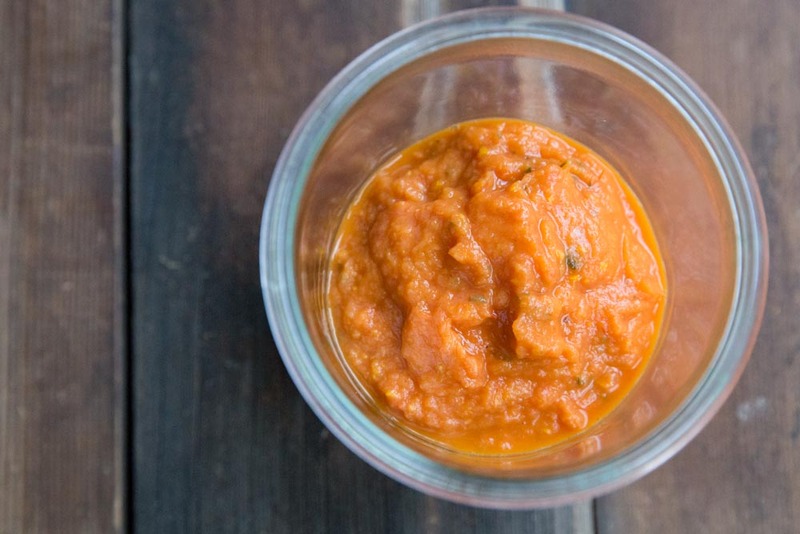 This Roasted Vegetable Pasta Sauce made in a blender is way better than ordinary marinara! Slice up tomatoes, onion, garlic, and vegetables. Place everything except the squash on prepared baking sheet. Try to have the veggies not overlapping. Drizzle with 1 tablespoon olive oil and season with salt and pepper. Roast this mixture for 30 minutes. Drizzle about a teaspoon of olive oil over the squash then season it with salt and pepper. After 30 minutes add the squash onto the roasting pan and flip the other veggies. 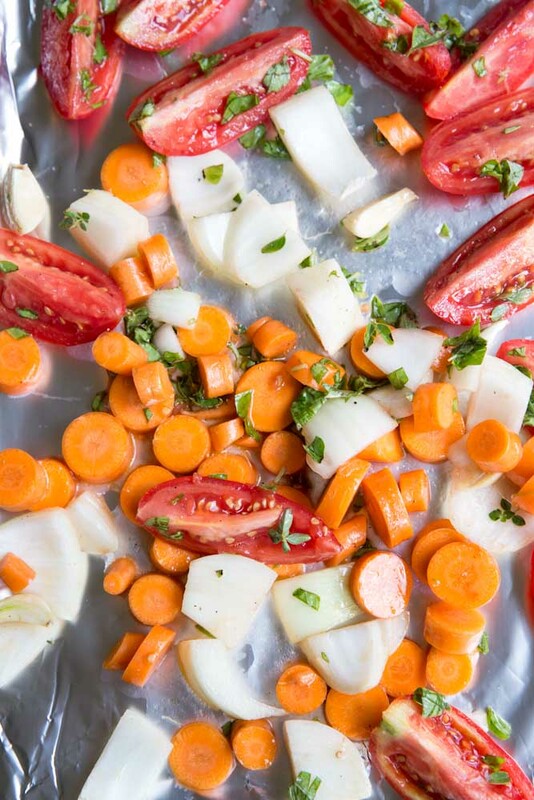 Roast for another 10-15 minutes or until squash and carrots are soft. Meanwhile cook up some pasta (I like to use whole wheat spaghetti with this sauce). Once veggies are done, transfer half of them into a blender and blend until smooth. Pour the sauce over hot pasta then top with remaining veggies and parmesan cheese. Summer squash can be substituted with butternut squash for a more fall alternative. I also use san Marzano tomatoes if I have access to them. This post was originally shared in Oct 2014. I love using my blender to make pureed baby food! I like making flours in the blender! Cori, I’m just discovering how easy it is to make homemade flours in the blender! Now, I’m opened up to a whole new world of recipes! Ohhh now you have me craving honey roasted peanut butter!!! I’m making that asap! I think the top few things I make in my blender are my sore throat ease drink, dips/salad dressings (especially the costa vida ranch copy cat), pesto, and I use it to puree soups because it makes it so much smoother than immersion blenders. I would love to hear more about the sore throat drink!! What is in it?! I really like to use my blender for super smooth soups…potato is the best! Another thing I’ve always wanted to try is a pots de creme recipe. Hopefully that one’s coming soon! I recently used my blender to blend up a mixture for lentil meatloaf! I love to make avocado sauce for pasta and veggie bowls! I like you on Facebook @Abby Dumont! I like to make butternut squash soup in my blender. Followed you on Facebook and Pinterest. Broccoli Avacado soup is one of my favorites. I’ve also made some Mango Sauce to go with Salad or even even Grilled Cod! Super easy: Slice mango, pear, yellow and red peppers and bring everything to boil with some white wine, garlic and pepper and then blend! Sigh – I don’t have any good blender recipes because I don’t have a good blender! My $20 target blender that I’ve had for 12 years just gets by making smoothies. I’ve always wanted to try making hummus and soups. My hubby and I make the easiest, most delicious broccoli soup using our blender. We just cook the broccoli in a large pot of boiling water until it is tender, then toss it all in the blender with some of the cooking water and blitz! Add more water to reach the consistency you like! It is so simple and so yummy! I love homemade Mac n cheese!! I only have an immersion blender so nice smooth soups don’t quite work out for me. 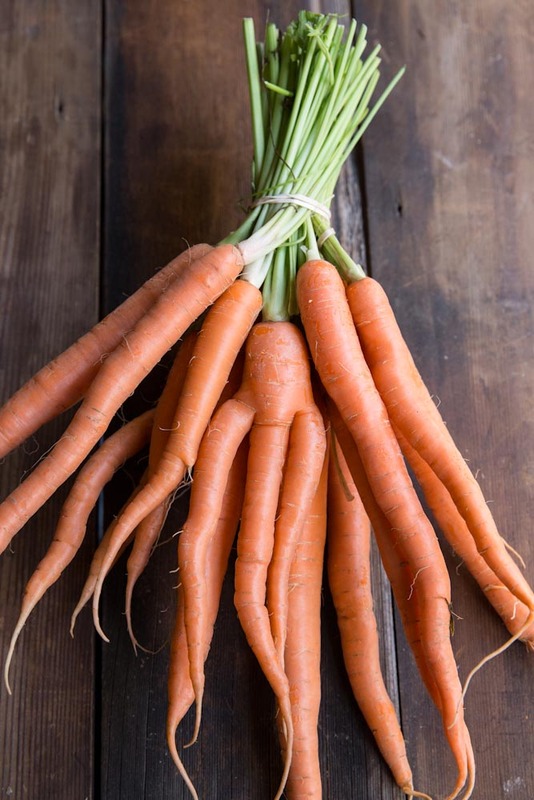 I’m dying to make the Haitian Corn & Sweet Potato soup from Green Kitchen Stories or any of the lovely sauces that Naturally Ella comes up with. Followed you on Insta (@udflyerkris). I’ll have to find that Haitian soup recipe! I went to Haiti a couple years ago and loved some of their food! Annie, I used to make spit pea in my blender until I totally destroyed my kitchen after a lid popped off once!! And I’ll have to try a good ole milkshake soon. It’s a toss up between Broccomole, peanut butter, and hummus – I make them all too much! Becky, what’s broccomole?!! Sounds fun! Sweet Potato and Chipotle soup…yum! And I am following you on Pinterest! I love to make homemade breadcrumbs in my blender! Thanks Jen! I’ll definitely try making breadcrumbs now! Great idea. My favorite non-smoothie blender recipe is Kabocha (Japanese pumpkin) Soup. I liked your blog page on Facebook. I love black bean soup — so you puree the black beans in the blender. So yummy! I using my blender to make tofu quiche by blending firm tofu and using it instead of eggs. I don’t have a food processor, so I rely on my blender to make protein pudding with silken tofu, blended spicy pumpkin soup, and hummus! Love making cauliflower and roasted garlic soup in our blender! I like to purée celery root – for soup, a sub for mashed potatoes, anywhere I can find to put it! I love soups… roasted tomato, onion, creme freche. I also follow you on FB. Note to self: the use of an immersion blender leads to covering yourself and the kitchen in delicious, delicious sauce. I love whipping up a batch of homemade tomato soup in my blender! Perfect addition to a lunch of grilled cheese. I make a really tasty enchilada casserole. Obviously I don’t blend the entire dish, but I use my blender to make a sauce: plain yogurt or sour cream, a package/bunch of spinach, cilantro, green chills, cumin, and some shredded cheese. Then I layer it with corn tortillas, beans and sautéed peppers and onions and bake. Also, I am now following you on Pinterest! I would love to make a tomato-carrot soup in the blender. I’d love to do a pumpkin soup in the blender! I make a VERY good hamburger OR barbecue meat topping. I mix a LOT of different ingredients and cannot give the recipe away: but I literally blend what normally goes on top of a hamburger and make it a puree sauce. Everyone loves it! Thanks for the chance to win! I WOULD LOVE THIS!! I love making savory and sweet dips in a blender. One of my favorite to do! I use my blender for sweet potato soup…mmm. I’m following you on Instagram. Just stopped by to get some inspiration for dinner, which I need often. 🙂 This looks delicious. As for recipes in a blender, butternut squash soup is one of our favs here (Sam’s speciality). I love using the blender to make salsa! Oh man, if I had a decent blender, I would go crazy on sauces and salad dressings and pesto. I now make a “chunky” pesto since none of my appliances really cut it. A romanesco sauce would probably be my first pick. One of my most favorite blender foods is Creamy Butternut Squash Soup. I just can’t seem to get enough of this soup. I follow VintageMixer on Pinterest as birdiebee52. This would be good on so many dishes! And I most love to make a creamy cilantro dressing in my blender. And put that on everything too! And finally on Google+. Yay! thanks friend!! I appreciate the support! ohh yes, I do also love gazpacho!! I like to make Roasted Butternut Squash Soup in my blender! I love cold blended soups! But I don’t actually own a blender, so I’ve never personally made any :/. I also love your thinking about vegetables just being vegetables! Congrats to the winner !! So jealous! I’ve never had a blender lol!! Desiree, I didn’t have a good one until recently either. It is definitely worth it!